You can never have too many Mediterranean recipes, so give Eggplant Parmesan Roll-Ups a try. This recipe serves 4. This hor d'oeuvre has 529 calories, 21g of protein, and 29g of fat per serving. For $3.65 per serving, this recipe covers 25% of your daily requirements of vitamins and minerals. 2 people were glad they tried this recipe. Head to the store and pick up onion, bell pepper, ricotta, and a few other things to make it today. It is brought to you by Foodista. From preparation to the plate, this recipe takes roughly roughly 45 minutes. With a spoonacular score of 77%, this dish is pretty good. Similar recipes include Eggplant Roll-Ups, Eggplant and Zucchini Roll Ups, and Grilled Eggplant Roll-Ups. Roll Ups can be paired with Sparkling rosé and Sparkling Wine. If you're serving a selection of appetizers, you can't go wrong with these. Both are very food friendly and complement a variety of flavors. One wine you could try is Bellissima Sparkling rosé. It has 4.5 out of 5 stars and a bottle costs about 24 dollars. Preheat oven to 350F and put water for linguine on to boil. Heat 1 teaspoon oil in a 2-quart heavy saucepan over medium heat and add onion and green pepper. Cook until just tender. Add garlic and red pepper flakes and continue to cook another 30 seconds. Add tomatoes and 1/2 teaspoon salt and simmer, uncovered, stirring occasionally, until slightly thickened, 15 to 20 minutes. Grill eggplant while sauce cooks. Heat grill pan over high heat until hot. Peel skin from eggplant and discard. Cut eggplant long-ways into 8 (1/3-inch-thick) slices. Lightly rush both sides of slices with 2 teaspoons oil (total), then season with salt and pepper. Grill slices in batches, turning over once l, until golden brown and tender, about 4 minutes, then transfer to a tray. Stir together ricotta and 1/2 cup Parmesan, basil, pepper, and remaining salt. Divide cheese mixture among slices. Roll up each slice. Place rolls in a small casserole dish and bake until cheese starts to melt, about 10 minutes. Meanwhile, cook linguine to package directions. 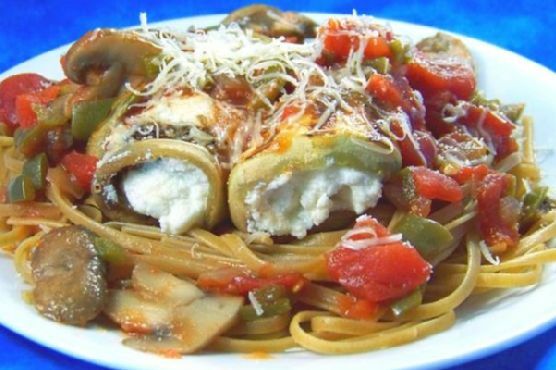 Serve rolls over linguine, topped with sauce and sprinkled with 1 tablespoon Parmesan each.